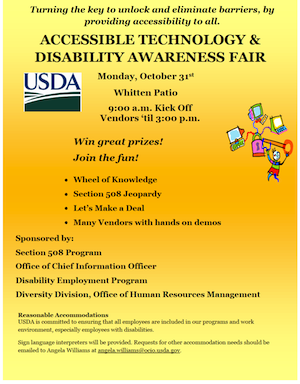 Join NetCentric at the USDA’s Accessible Technology and Disability Awareness Fair, where the goal is to unlock and eliminate barriers by providing accessibility to all. 9:00 a.m. Kick Off, Vendors untiltil 3:00 p.m. Win great prizes! Join the fun! USDA is committed to ensuring that all employees are included in our programs and work environment, especially employees with disabilities. Sign language interpreters will be provided. Requests for other accommodation needs should be emailed to Angela Williams at angela.williams@ocio.usda.gov.